These days it’s allowed to take pictures in museums for private purposes. It makes no sense anymore to forbid taking pictures. The mobile cameras are so tiny these days, the museum attendants couldn’t control all the people who like to take a picture. Today I visited an exhibition with pictures of Carl Strathmann. The title of the exhibition: Jugendstil bizarre'.. About 7 pictures weren’t allowed to photograph. They were pictures on loan from other museums that didn’t allow to photograph them. Next to these pictures was the symbol for ‘no pictures’. Yet all the other pictures were allowed to photograph. Using flash is never allowed in museums. It’s understandable. It would annoy all the other visitors if every other moment another flash would illuminate the room. This means one must know the own camera. One must know how to switch off the built-in flash. In addition one must know how to compensate the lack of light. It’s possible to hold down the flash. Yet usually one wants to take pictures of good quality. 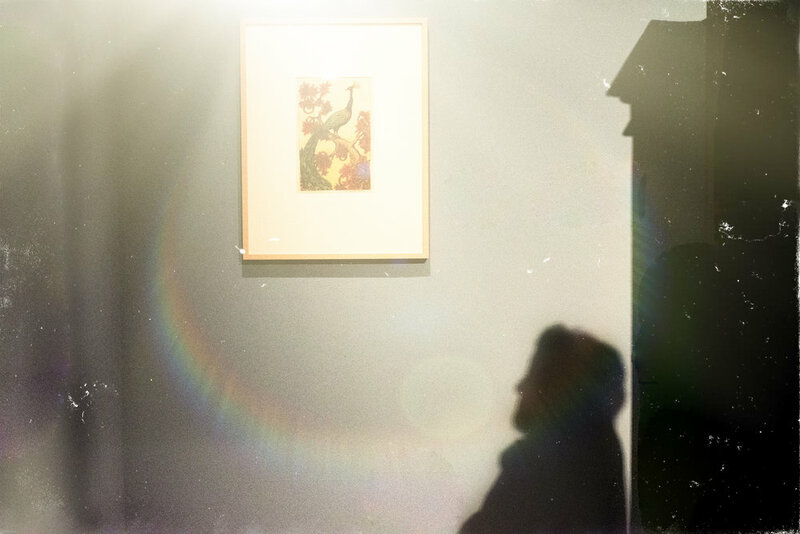 In museums the light situation can be called difficult. There are often artificial lights to highlight the pictures. The rooms are often very dark. Sometimes the light mirrors in the glass that protects the pictures. Light changes all the time. Also the brightness of the pictures or exhibits changes all the time. ISO comes into play again. I set it on Auto. It compensates the flash and adjusts quickly. If one likes Art Nouveau in general, one might also like Carl Strathmann. I liked his pictures and created even a board on Pinterest. Yet in museums I often think that the visitors are as interesting as the pictures or exhibits. Seeing the work of other artists is very inspiring. Every artist has another favorite topic. How the topics are presented and translated is so different like the artists themselves. Every artist has his/her own language and own preferences. Most photographers are autodidacts. So am I. There are many ways to learn and to improve photography. In this blog I’ll write about my journey as a photographer. Might it help you to accelerate your learning.